Apraxia is a motor disorder caused by damage to the brain (specifically the posterior parietal cortex) in which the individual has difficulty with the motor planning to perform tasks or movements when asked, provided that the request or command is understood and the individual is willing to perform the task. The nature of the brain damage determines the severity, and the absence of sensory loss or paralysis helps to explain the level of difficulty. The term comes from the Greek ἀ- a- ("without") and πρᾶξις praxis ("action"). Ideomotor apraxia: These patients have deficits in their ability to plan or complete motor actions that rely on semantic memory. They are able to explain how to perform an action, but unable to "imagine" or act out a movement such as "pretend to brush your teeth" or "pucker as though you bit into a sour lemon." However, when the ability to perform an action automatically when cued remains intact, this is known as automatic-voluntary dissociation. For example, they may not be able to pick up a phone when asked to do so, but can perform the action without thinking when the phone rings. Ideational/conceptual apraxia: Patients have an inability to conceptualize a task and impaired ability to complete multistep actions. Consists of an inability to select and carry out an appropriate motor program. For example, the patient may complete actions in incorrect orders, such as buttering bread before putting it in the toaster, or putting on shoes before putting on socks. There is also a loss of ability to voluntarily perform a learned task when given the necessary objects or tools. For instance, if given a screwdriver, the patient may try to write with it as if it were a pen, or try to comb their hair with a toothbrush. Buccofacial or orofacial apraxia: Non-verbal oral or buccofacial ideomotor apraxia describes difficulty carrying out movements of the face on demand. For example, an inability to lick one's lips or whistle when requested suggests an inability to carry out volitional movements of the tongue, cheeks, lips, pharynx, or larynx on command. Constructional apraxia: The inability to draw or construct simple configurations, such as intersecting shapes. Gait apraxia: The loss of ability to have normal function of the lower limbs such as walking. This is not due to loss of motor or sensory functions. Limb-kinetic apraxia: voluntary movements of extremities are impaired. For example, a person affected by limb apraxia may have difficulty waving hello. Oculomotor apraxia: Difficulty moving the eye, especially with saccade movements that direct the gaze to targets. This is one of the 3 major components of Balint's syndrome. Apraxia of speech (AOS): Difficulty planning and coordinating the movements necessary for speech (e.g. Potato=Totapo, Topato.) AOS can independently occur without issues in areas such as verbal comprehension, reading comprehension, writing, articulation or prosody. Apraxia is most often due to a lesion located in the dominant (usually left) hemisphere of the brain, typically in the frontal and parietal lobes. Lesions may be due to stroke, acquired brain injuries, or neurodegenerative diseases such as Alzheimer's disease or other dementias, Parkinson's disease, or Huntington's disease. It is also possible for apraxia to be caused by lesions in other areas of the brain including the non-dominant (usually right) hemisphere. Ideomotor apraxia is typically due to a decrease in blood flow to the dominant hemisphere of the brain and particularly the parietal and premotor areas. 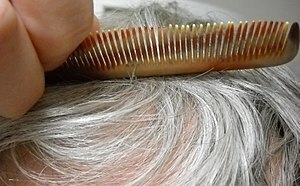 It is frequently seen in patients with corticobasal degeneration. Ideational apraxia has been observed in patients with lesions in the dominant hemisphere near areas associated with aphasia; however, more research is needed on ideational apraxia due to brain lesions. The localization of lesions in areas of the frontal and temporal lobes would provide explanation for the difficulty in motor planning seen in ideational apraxia as well as its difficulty to distinguish it from certain aphasias. Constructional apraxia is often caused by lesions of the inferior non-dominant parietal lobe, and can be caused by brain injury, illness, tumor or other condition that can result in a brain lesion. Although qualitative and quantitative studies exist, there is little consensus on the proper method to assess for apraxia. The criticisms of past methods include failure to meet standard psychometric properties as well as research-specific designs that translate poorly to non-research use. The Test to Measure Upper Limb Apraxia (TULIA) is one method of determining upper limb apraxia through the qualitative and quantitative assessment of gesture production. In contrast to previous publications on apraxic assessment, the reliability and validity of TULIA was thoroughly investigated. The TULIA consists of subtests for the imitation and pantomime of non-symbolic (“put your index finger on top of your nose”), intransitive (“wave goodbye”) and transitive (“show me how to use a hammer”) gestures. Discrimination (differentiating between well- and poorly performed tasks) and recognition (indicating which object corresponds to a pantomimed gesture) tasks are also often tested for a full apraxia evaluation. However, there may not be a strong correlation between formal test results and actual performance in everyday functioning or activities of daily living (ADLs). A comprehensive assessment of apraxia should include formal testing, standardized measurements of ADLs, observation of daily routines, self-report questionnaires and targeted interviews with the patients and their relatives. As stated above, apraxia should not be confused with aphasia; however, they frequently occur together. It has been stated that apraxia is so often accompanied by aphasia that many believe that if a person displays AOS; it should be assumed that the patient also has some level of aphasia. Treatment for individuals with apraxia includes speech therapy, occupational therapy, and physical therapy. Generally, treatments for apraxia have received little attention for several reasons, including the tendency for the condition to resolve spontaneously in acute cases. Additionally, the very nature of the automatic-voluntary dissociation of motor abilities that defines apraxia means that patients may still be able to automatically perform activities if cued to do so in daily life. Nevertheless, research shows that patients experiencing apraxia have less functional independence in their daily lives, and that evidence for the treatment of apraxia is scarce. However, a literature review of apraxia treatment to date reveals that although the field is in its early stages of treatment design, certain aspects can be included to treat apraxia. One method is through rehabilitative treatment, which has been found to positively impact apraxia, as well as activities of daily living. In this review, rehabilitative treatment consisted of 12 different contextual cues, which were used in order to teach patients how to produce the same gesture under different contextual situations. Additional studies have also recommended varying forms of gesture therapy, whereby the patient is instructed to make gestures (either using objects or symbolically meaningful and non-meaningful gestures) with progressively less cuing from the therapist. It may be necessary for patients with apraxia to use a form of alternative and augmentative communication depending on the severity of the disorder. In addition to using gestures as mentioned, patients can also use communication boards or more sophisticated electronic devices if needed. No single type of therapy or approach has been proven as the best way to treat a patient with apraxia, since each patient's case varies. However, one-on-one sessions usually work the best, with the support of family members and friends. Since everyone responds to therapy differently, some patients will make significant improvements, while others will make less progress. The overall goal for treatment of apraxia is to treat the motor plans for speech, not treating at the phoneme (sound) level. Research suggests that individuals with apraxia of speech should receive treatment that focuses on the repetition of target words and rate of speech. Research rerouted that the overall goal for treatment of apraxia should be to improve speech intelligibility, rate of speech and articulation of targeted words. The prognosis for individuals with apraxia varies. With therapy, some patients improve significantly, while others may show very little improvement. Some individuals with apraxia may benefit from the use of a communication aid. However, many people with apraxia are no longer able to be independent. Those with limb-kinetic and/or gait apraxia should avoid activities in which they might injure themselves or others. Occupational therapy, physical therapy, and play therapy may be considered as other references to support patients with apraxia. These team members could work along with the SLP to provide the best therapy for people with apraxia. However, because people with limb apraxia may have trouble directing their motor movements, occupational therapy for stroke or other brain injury can be difficult. No medication has been shown useful for treating apraxia. ^ "Definition of APRAXIA". www.merriam-webster.com. Retrieved 2017-05-02. ^ a b Sathian, K; et al. (Jun 2011). "Neurological and rehabilitation of action disorders: common clinical deficits". Neurorehabilitation and Neural Repair. 25 (5): 21S–32S. doi:10.1177/1545968311410941. PMC 4139495. PMID 21613535. ^ a b c d Gross, RG; Grossman, M. (Nov 2008). "Update on apraxia". Current Neurology and Neuroscience Reports. 8 (6): 490–496. doi:10.1007/s11910-008-0078-y. PMC 2696397. PMID 18957186. ^ Nadeau SE (2007). "Gait apraxia: further clues to localization". Eur. Neurol. 58 (3): 142–5. doi:10.1159/000104714. PMID 17622719. ^ Heilman KM, Watson RT, Gonzalez-Rothi LJ. Praxis. In: Goetz CG. Goetz: Textbook of Clinical Neurology. 3rd ed. Philadelphia, PA: Saunders Elsevier; 2007:chap 4. ^ Duffy, Joseph R. (2013). Motor Speech Disorders: Substrates, Differential Diagnosis, and Management. St. Louis, MI: Elsevier. p. 269. ISBN 978-0-323-07200-7. ^ a b Tonkonogy, Joseph & Puente, Antonio (2009). Localization of clinical syndromes in neuropsychology and neuroscience. Springer Publishing Company. pp. 291–323. ISBN 0826119670. ^ a b c Vanbellingen, T.; Bohlhalter, S. (2011). "Apraxia in neurorehabilitation: Classification, assessment and treatment". NeuroRehabilitation. 28 (2): 91–98. doi:10.3233/NRE-2011-0637. PMID 21447909. ^ Vanbellingen, T.; Kersten, B.; Van Hemelrijk, B.; Van de Winckel, A.L.J. ; Bertschi, M.; Muri, R.; De Weerdt, W.; Bohlhalter, S. (2010). "Comprehensive assessment of gesture production: a new test to measure upper limb apraxia". European Journal of Neurology. 17 (1): 59–66. doi:10.1111/j.1468-1331.2009.02741.x. PMID 19614961. ^ "NINDS Apraxia Information Page". Retrieved 8 March 2012. ^ Hanna-Pladdy, B; Heilman, K.M. ; Foundas, A.L. (Feb 2003). "Ecological implications of ideomotor apraxia: evidence from physical activities of daily living". Neurology. 60 (3): 487–490. doi:10.1212/wnl.60.3.487. PMID 12578932. ^ West, C; Bowen, A.; Hesketh, A.; Vail, A. (Jan 2008). "Interventions for motor apraxia following stroke". Cochrane Database of Systematic Reviews. 23 (1): CD004132. doi:10.1002/14651858.CD004132.pub2. PMID 18254038. ^ a b c Buxbaum LJ, Haaland KY, Hallett M, et al. (February 2008). "Treatment of limb apraxia: moving forward to improved action" (PDF). Am J Phys Med Rehabil. 87 (2): 149–61. doi:10.1097/PHM.0b013e31815e6727. PMID 18209511. ^ Smania, N; et al. (Dec 2006). "Rehabilitation of limb apraxia improves daily life activities in patients with stroke". Neurology. 67 (11): 2050–2052. doi:10.1212/01.wnl.0000247279.63483.1f. PMID 17159119. ^ "ASHA, Apraxia of Speech in Adults". ^ Dovern, A.; Fink, GR. ; Weiss, PH. (Jul 2012). "Diagnosis and treatment of upper limb apraxia". J Neurol. 259 (7): 1269–83. doi:10.1007/s00415-011-6336-y. PMC 3390701. PMID 22215235. ^ Wambaugh, JL; Nessler, C; Cameron, R; Mauszycki, SC (2012). "Acquired apraxia of speech: the effects of repeated practice and rate/rhythm control treatments on sound production accuracy". American Journal of Speech-Language Pathology. 2: S5–S27. doi:10.1044/1058-0360(2011/11-0102. Fish, Margaret; "Here's How to Treat Childhood Apraxia of Speech, Second Edition". San Diego: Plural Publishing, Inc., 2015. Kasper, D.L. ; Braunwald, E.; Fauci, A.S.; Hauser, S.L. ; Longo, D.L. ; Jameson, J.L.. Harrison's Principles of Internal Medicine. New York: McGraw-Hill, 2005. ISBN 0-07-139140-1. Manasco, H. (2014). Introduction to Neurogenic Communication Disorders. Jones & Bartlett Publishers.